Yesterday Ypsomed launched the myLife Ypsopump in Australia. It was an interesting day! To get the disclosures out of the way: Ypsomed paid for my travel and accommodation expenses to attend their event in Sydney. Along with a small cadre of other diabetes advocates and bloggers from across the country, we met with Australian and Swiss management and staff from Ypsomed, got to have hands-on experience with the pump and accessories, and were able to provide them with feedback from the points of view of people who actually live with insulin pumps. We’ve been provided with sample pumps to experiment with. I’m still experimenting with it, so this post is just my first impressions. Please note that Ypsomed have not asked for me to promote or in fact write anything about the Ypsopump. I am grateful for the opportunity to learn about their product, but you can judge for yourself if you think I’m biased as a result. It uses Ypsomed’s own Orbit soft and Orbit micro infusion sets (mentioned in my recent cannula post). I’m quite liking these so far. The Orbit micro has the finest gauge (31G) of any steel cannula available. The infusion sets have a one-way valve at the pump end of the tubing, designed to eliminate any siphon effect that might interfere with the expected insulin flow. The pump integrates with the MyLife app on your phone (iPhone or Android, in the App/Play Stores) via Bluetooth. Currently this connection just records the pump status and events in the app (and through to their cloud database where you can choose to share the data with family and your medical team) but more features will be coming to allow control of the pump without taking it out of your pocket. The Ypsopump has been tested at altitudes up to 5500 m! This is very unusual. Most other insulin pumps are only certified up to 3000 m. Many people live at lower altitudes and thus don’t pay any attention to this, but I’ve exceeded 3000 m altitude in India, Switzerland, and Borneo, including spending over a week above 4000 m. So for me it’s very reassuring to know that my life-saving pump isn’t likely to die. Although the pump has a Bluetooth connection, it can’t be used in any closed-loop system at the moment. There are some developments in the planned product roadmap which might enable this in the future, but that’s not an option at this point. Overall my impression is that it’s a competent little pump, and will provide great service for many people with diabetes. Ypsomed’s launch event is continuing with several days working with diabetes educators, so I’m sure that more information about the pump will be available to you soon (usually funded through private health insurance). As I’ve previously noted, the consumables for the pump are already available through normal NDSS channels. 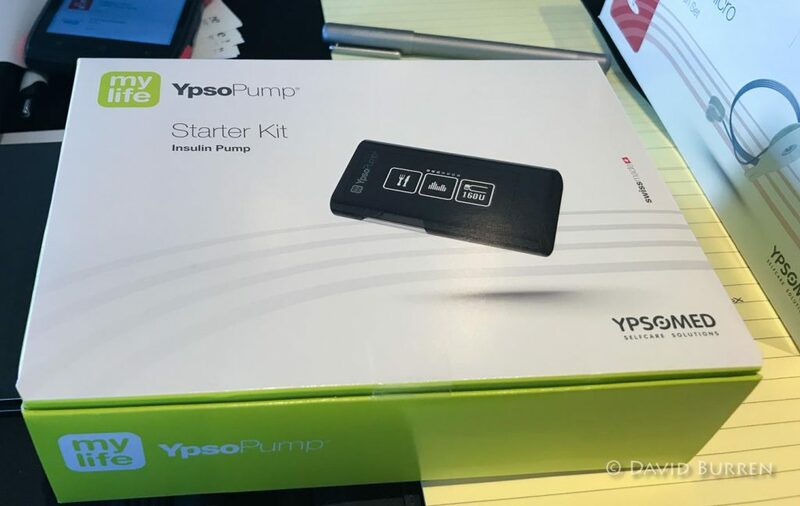 I’ll be doing more work with the Ypsopump over the coming weeks, but don’t at this point plan on doing a full review of the unit as a standalone pump. We’ll see what happens. Is it waterproof and how often do you need to change sites? All infusion sites on the market are approved for 3 days (teflon) or 2 days (steel). Because the reservoir in this pump is glass the insulin is approved to be in the reservoir for longer, but the cannula life is unchanged. So no cgm with rhis pump as yet ? Would like more info. Can you supply company contacts in australia ? There’s a link to the company’s local website above. They’re based in Sydney (including the customer support centre). No the pump doesn’t receive CGM directly from sensors. In the future the CGM link will be via your phone. Does it take the prefilled insulin cartridge 3ml? The self-filled reservoir is 1.6 ml. 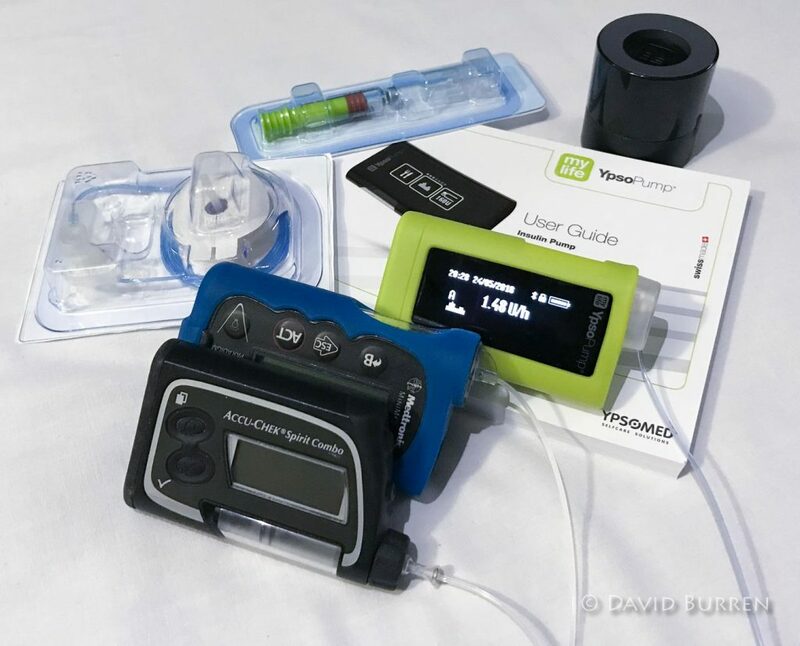 In Europe the NovoRapid PumpCart is available for this pump, and yes that’s a pre-filled reservoir (it’s also used there for the Accu-Chek Insight pump). But the PumpCart is not brought into Australia by Novo yet. So in Australia no on both counts. Not 3 ml, and not pre-filled. What is the usage stance for medications other than insulin? For example, does the Ypsopump warranty cover use in such circumstances? I currently have a fairly new pump for use with another medication, for another Endocrinological condition. My pump is fully covered under its warranty provided by the manufacturer because afterall, my medication is in liquid form, as is insulin. The pump was covered by my private health insurance and consumables are subsidised. So although my usage is technically off-label, (if one assumes that these devices were only invented for diabetics), it has been approved by each of the supplying agents, including the Minister for Health. I don’t know, but you could ask Ypsomed directly. I do know of a number of people with chronic conditions (other than T1D) who use pumps made for insulin to infuse their drugs. So you’re not alone. I guess I’ll find Ypsopump’s contact details online somewhere! Their contact details are at the bottom of their website. Hi Megan. I’m in the process of getting a pump for an off label use – Adrenal Insufficiency with solu-cortef. Have you received an answer about warranty for the Ypsomed pump? If you don’t mind me asking, which pump are you currently using with a warranty? (Sorry to hi-jack the thread David).